D-Tech RFIQ™ is proving very popular in School Libraries as it is affordable, effective, easy to implement and utilises the latest technology. Library items are 'tagged' with small RFID (radio frequency identification) microchips that can be read by security gates at the library entrance. If the item hasn't been 'issued' when it leaves the library, the security gates sound an alarm which provides an effective deterrent. 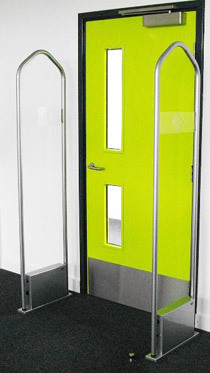 Unlike tattle-tape EM library systems; D-Tech RFIQ™ is the only security system upgradeable to full RFID, with 'false alarm free' security gates that boast a detection rate of up to 95%. 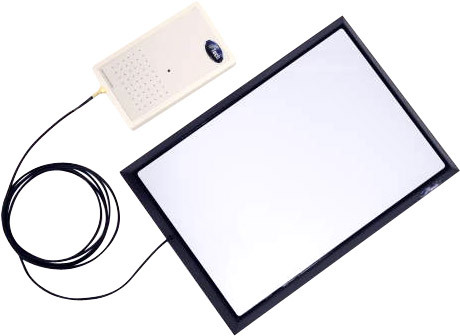 How does an RFIQ™ security system function? RFIQ™ tags are applied to all of your library items. This tag contains a microchip which is able to be wirelessly programmed with a security status ('checked in' or 'checked out'). 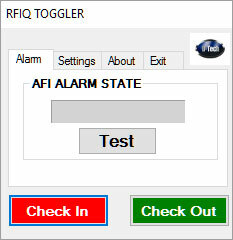 Programming of the RFIQ™ tags is performed by the RFIQ™ 'Staffpad' which is connected to your counter computer and is controller by the RFIQ™ Toggler software application. This easy to use software floats over the top of your library management software for easy access. (See screenshot below). When a book is placed onto the Staffpad (optionally mounted underneath the counter and out of sight), the librarian can switch the security status to 'Checked In' or 'Checked Out' with a single mouse-click on the RFIQ™ Toggler application. If a person tries to leave the library through the security gate aisles when the item has not been issued, a loud audible alarm will start and lights on the master gate will display. Available in single, dual, triple or even quad aisle configurations with an integrated alarm and light. What's involved with tagging your library for RFIQ™? RFIQ™ tags are very similar to self-adhesive labels and this makes them much easier to apply than EM tattle-tape strips and any existing tags do not need to be removed. A group of students or a working bee of helpers is more than capable of quickly processing a libraries inventory with minimal training. We provide your RFIQ labels 'pre-programmed' so that your library stock is protected the moment it is applied, making the protection of your library stock very fast, easy and efficient. Recently Hamilton Boys’ High School Library had a D-Tech RFIQ security system installed by Library Plus. Library Plus also supplied us with security labels for the book collection and the DVD collection. Library Plus provides on going service and if any issues occur it is problem-solved fast and efficiently. Steve Sussex is very approachable and professional. Everything is done to a very high standard. The gates are sturdy yet aesthetically pleasing and the security pads are hidden from view giving the issues and returns desk a cleaner look. The D-Tech RFIQ security system is a modern up to date system which will be compatible to any Library Management System and is adaptable for any future development. I can highly recommend Library Plus to any library looking to update their security system.